1. From the vSphere client, connect to vCenter. 2. From Home, select Licensing under the Administration section. 3. 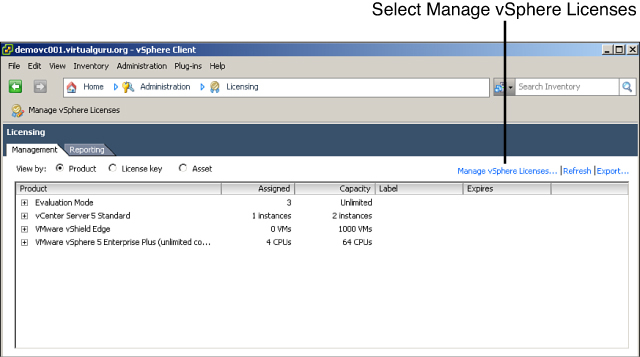 Select Manage vSphere Licenses (Note: It is the blue “Manage vSphere Licenses” hyperlink on the right of the screen to the left of the Refresh and Export links), as shown in Figure 9. Figure 9. Select Manage vSphere Licenses. 4. Enter the license key in the Enter new vSphere License Keys section and provide a label such as vOPs. Click Next. 5. 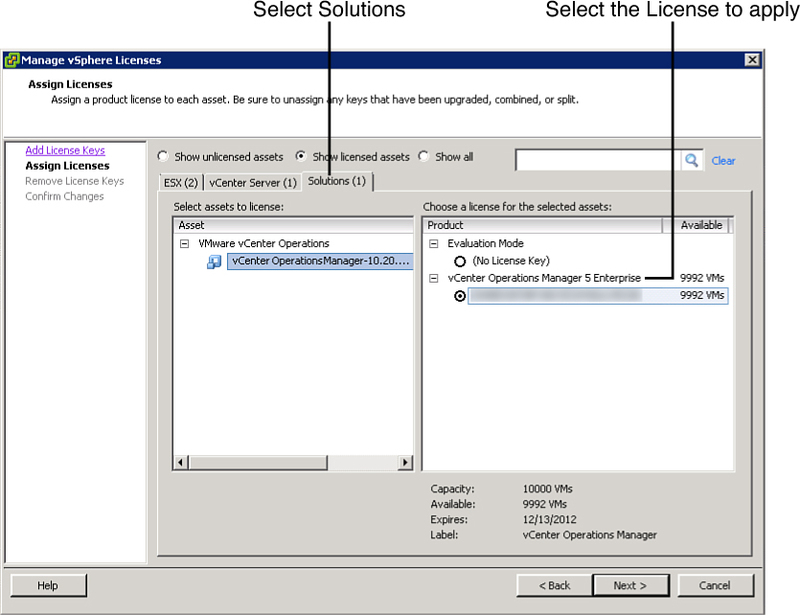 Under Assign Licenses, click the Solutions tab and select Show All (see Figure 10). Select your vCenter Operations, select the license key, and click Next. 6. If you want to remove any license keys, do so; otherwise, click Next and Finish on the confirmation page to apply your license changes. After it is installed, configured, and licensed, you can enable the plug-in to view the components of vCenter operations. To do this within your vSphere Client, select Plug-ins and Manage Plug-ins and enable the vCenter Operations Manager (see Figure 11). Figure 11. Install the plug-in. To access vCenter Operations Manager, open your vSphere client, and from the Home tab, click vCenter Operations under the Solutions and Applications pane. You can also access vCenter Operations by browsing directly to the IP of the UI appliance, which can be quicker. It is important to realize that there is a relationship between the Hosts and Clusters tree view on the left and the display panels on the right. Certain objects in the tree on the left don’t display certain properties because they are not relevant to what you have selected. For example, virtual machines that are gray in color are typically not powered on. To get a high-level view of general health, select your datacenter on the left and ensure the dashboard is visible on the right (see Figure 12). Figure 12. Select your datacenter and view your dashboard on the right. Notice that the datacenter has three high-level ratings more commonly referred to as badges in vCenter Operations. Each of these major badges is made up of a combination of minor badges to help you get a good picture of the environment. In general, Health is largely made up of real-time metrics, Risk looks at capacity and how long over a period of time the VMs may be stressed or struggling for resources, and Efficiency looks at how well you are currently using the environment. Efficiency includes a reference for optimal configurations such as your host-to-VM ratio or CPU-to-VM ratio. The Health badge is a combination of Workload, Anomalies, and Faults. Workload measures the four pillars of performance in virtual infrastructure: CPU, Memory, Disk I/O, and Network I/O (see Figure 13). A high workload number indicates resources that are heavily utilized. Figure 13. The Workload badge.